Hi Everyone! I hope you enjoyed your weekend. After having an unplanned mini vacation from work last week, I spent my last weekend before I start my internship relaxing and Bobby and I went to a birthday BBQ/House Warming Party/and hey your having a baby, how exciting party (that’s what I am gonna call it anyway)! Thanks again for a great night Alex and Nicole (in the off chance you are reading this). What I am trying to say is that last week was my last week of freedom until December! I will be putting in 35-40 hours a week at an unpaid internship, working 16-20 hours a week, and going to school (LAST SEMESTER, :D) I hope to be able to keep up with my posts, but if they seem fewer than usual, well now you know why! 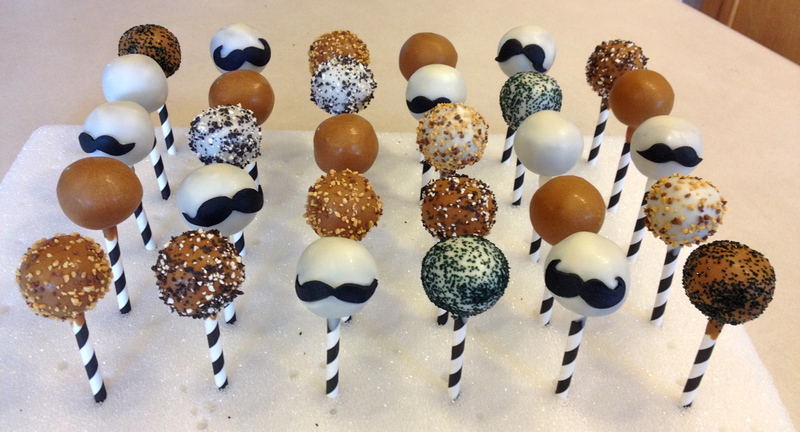 Welcome to week two of weekly cake pops! This was an order I had for a dirty thirty, and my first male customer (his awesome wife got them for him, but they were still designed for a guy in mind) which is new to me, and it was fun! The flavor theme was chocolate and peanut butter, so I used a chocolate cake- then half were coated in PB candy melt, and then the other half had PB chips inside. What can I say, I am super creative… NOT. For some reason, these look very masculine to me, must be the brown and black together. Am I the only one?! 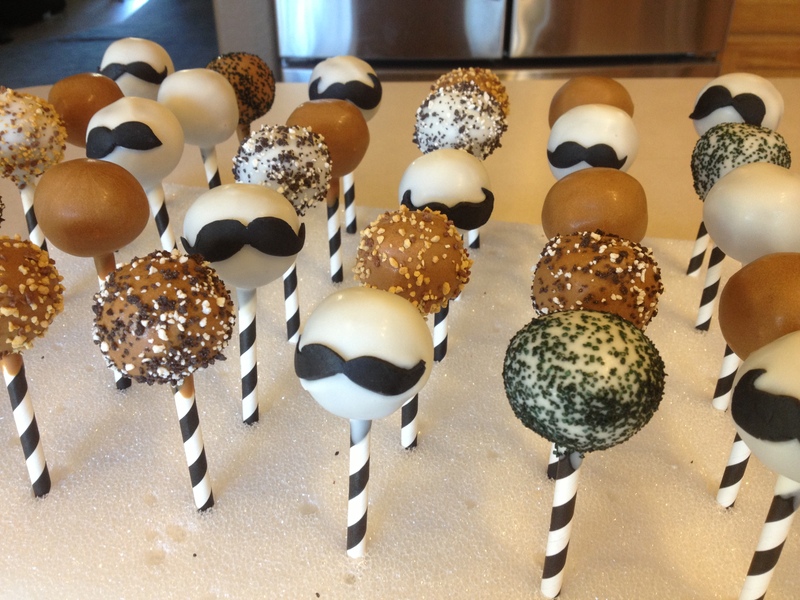 Oh, and some had mustaches on them.. which basically makes them the best ever in 30th birthday cake pops! Right?!? The sticks (actually thick cardboard straws) were from hobby lobby, in the party theme/planning sections. 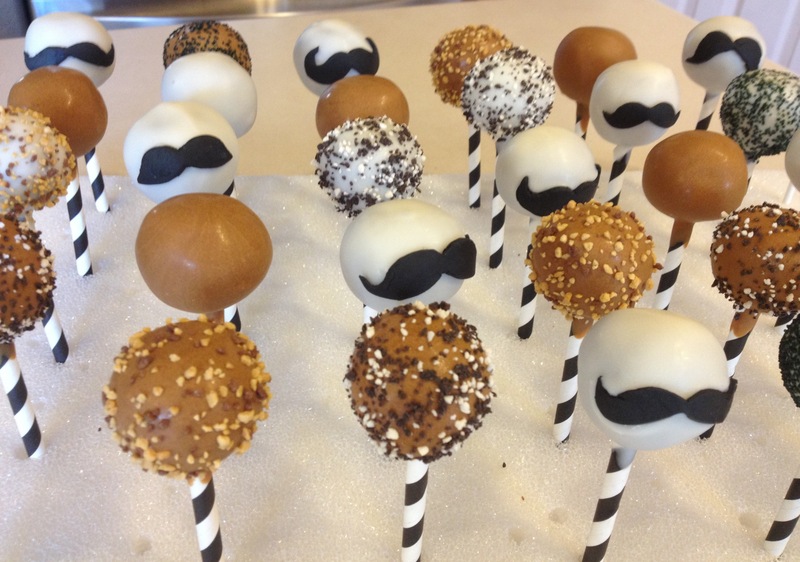 The mustaches are made with fondant.